This week, John wondered, "Transition?" I had a lot of thoughts about transition. I had many grand paragraphs mapped out in my head. They had to do with work, and my life, and made me think a lot about both, which I imagine was kind of the point. 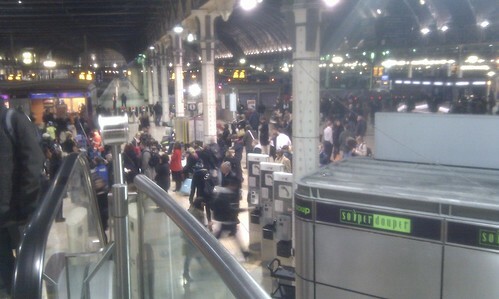 Paddington station, at 6.30 this evening. Having grown up on the south coast, my gateway to London was always Waterloo. When I moved away from my home town at 17 and into my first bedsit, I went through Waterloo, and it became very familiar and comforting to me. When I moved to Bristol Paddington became the gateway and I did not like it. For a start, it is absolutely vast, or at least has the impression of being so with its vaulted ceiling; and then there are all the things like having to learn new tube routes and bus numbers. It took me until the tube strike in 2009 to work out where, geographically, it lies; until then it seemed to exist in some sort of void, miles from anywhere. It's gradually become like Waterloo to me, though. For a start it was built by Brunel, who had a similar transition through his life to me (born in Portsmouth, lived in London, lived in Bristol), which I quite like. Then there is the shift in my outlook: for a long time moving back to London was something longed-for but impossible. Paddington was just a reminder, every trip, that I had to leave it again. Now I am older and I know I would be miserable there. There's nowhere to park, for a start. And I was a student for most of my London life, so of course I have fond memories of those heady days where responsibility was a thing of the future. Having moved on in my life, Paddington has now become almost a refuge, because I know that once I get there I'm only a couple of hours away from home. So I took this picture this evening to share with you. Me: Erm. I tripped over on the belt and had to eat everything I touched? Mr Z: How many times did you go round? Me: I'm still going. This woman keeps pointing at me and asking if I'm the vegetarian option. Mr Z: Moo at her next time round. Nonsense. Pure nonsense, perfect for a Friday night. Please go and have a read of all the other Weekword entries, you can find the list here. I know I will be! The station is a perfect representation of transition. JPE & I used the Paddington station last summer! WOW! trippy - memories! I love the conversation you had with MrZ... of course, you MUST get something to eat - golly! you've had a loooonnnnggg day at work! and another tomorrow! Could you explain what "exams" are? are you taking them? or giving them (to your students)? love your transition story! Agree with Junebug! Great story and photos; love hearing of lives in the other part of the world. Oh I'm the newbie weekworder. Oh, lovely post! Never been to Paddington station but I love your words and photo. Your last bit made me have my first laugh of the day! Thanks for playing weekWORD! B. What a thoroughly enjoyable post, sharing a part of your life, always in transition. Thank you for joining in. Paddington station, wow. What a place! Looks chaotic. 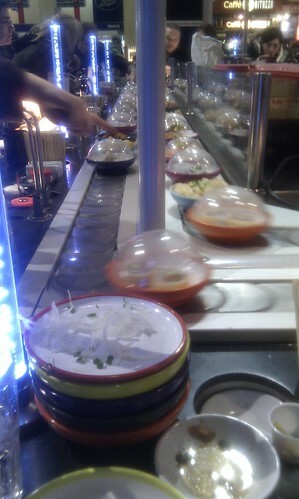 Hah, I looovvvee me some sushi!! What a fun post and so very different than my daily views-a total treat!